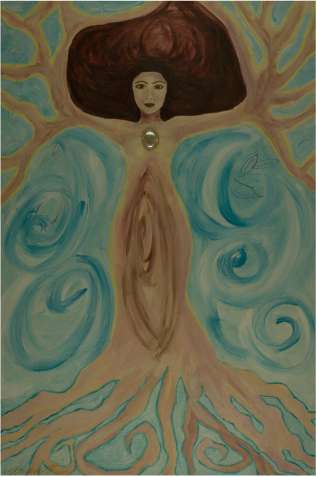 Copyright 2013 Yvonne Brock, "She Who Knows"
Awaken to greater balance by connecting more deeply with the Divine/Consciousness. Embrace yourself as innately sacred and powerful. Embody spiritual/contemplative practices that nurture, and reinforce your spirit. Honor life passages: empowerment, spiritual name, women’s transitions, new & dissolved partnerships (personal/work), school, career, & home clearing/blessing. Please contact me to schedule a workshop, retreat or session using Creative Expression, Ceremony, Labyrinth, or any combination of the aforementioned. An expansion of your inner knowing, and your spiritual development may be experienced. This new alignment may enliven and balance your body, mind & spirit. Please contact me to schedule a workshop, retreat or session. My services are informed by Transpersonal theory, Spiritual Guidance theory, Native Wisdom, and contemplative practices. I hold that my work is guided by a genderless Creator, and Mother Earth. The supportive container created for this work is aligned for women who have spiritual/consciousness growth intentions, and have done some work along this journey. Since I offer art and holistic services, and not psychological diagnosis, it is best to work with a Licensed Marriage Family Therapist, Licensed Clinical Social Worker, Psychologist, or Psychiatrist if you feel you may need psychological or emotional support. I have a M.A. in Transpersonal Psychology, Graduate Certificate in Spiritual Guidance, B.A. in Graphic Design, and a Reiki Certificate.